Kevin A. Hall is a Pathfinder, and a Storyteller. He believes that we all receive sparks from a place and from times which are challenging to converse with and about, yet some of us remain directed to shoot the Main Street fires in our minds full of holes to become whole. Or, maybe, we get whispers about letting the rain do the trick when our green shirt starts to smell of burnt hair, but we don’t always hear them. If Kevin’s head is something like a radio, he seems to receive a wide variety of stations. His debut memoir “Black Sails White Rabbits; Cancer Was the Easy Part” garnered 50 of 50 five star reviews on Amazon. His second book has the working title ‘A Portrait of the Artist Formerly Known as Bipolar’. It was due out by now, but is running late. However, New York Times bestselling author Mary Pilon’s “The Kevin Show” was published by Bloomsbury in March of 2018. Kevin currently lives in Hudson, NY with his wife and their three children, lots of books and music, and a labradoodle named Blue. 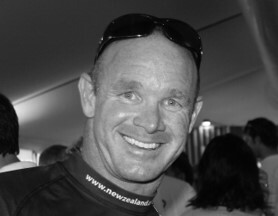 Award-winning Olympic sailor Kevin A. Hall shares a stunningly candid chronicle of the thrilling highs and devastating lows of living and loving through the rough seas of bipolar disorder. To my family, thank you with my whole soul. 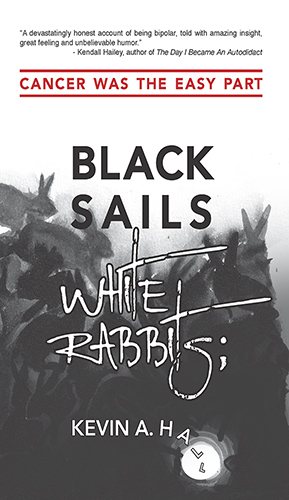 A “live-in mistress” who walks and talks like a book and doesn’t even clear her own dishes is not the best situation for kids, family life, and marriage, but that is essentially what Black Sails White Rabbits; Cancer Was the Easy Part was for quite a few months. She’s gone now, and I’m back. I love you. To Mom, Dad, and Sis, I love you. I have always believed in the power of a good coach. I had the extremely good fortune to be paired with one of the best. This book would be unrecognizable without the relationship which Stephanie Gisondi-Little and I built during our time working together on a novel, a project best left where it is and honorably replaced by this one. A squadron of late-manuscript readers responded with speed, accuracy and finesse. To Marly Isler and Peter Johnstone, thank you. To Rev. Mary and Robert Johnstone, thank you. 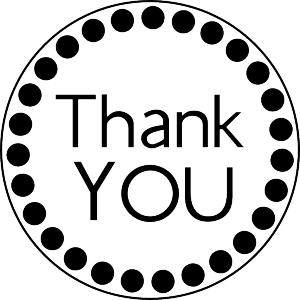 Allie Rowe, Andrea Charles Leal, Angus Philips, Bonnie Shope, Chip Johns, Craig Guthrie, Frédéric Peletier, Glenn Styron, Greg Switlik, Jennie Fitzhardinge, Julie Daily, Dr. Jeffery Hunt, Dr. Joel Gold, Kathleen Hall, Jacqueline Canty-Brady, John Harris, Kylie Mottl, Libby Johnson-McKee, Liz Hall Gaston, Mandy Jakich, Melissa Taylor, Morgan Larson, Nancy Peck, Nathaniel Philbrick, Rob Snyders, Shannon Geary Weisleder, Susie Minton, and Tom Price, the book is better because of your efforts, your generous time and care with my words. The Black Sails Posse Facebook group balanced the power and focus of individual feedback with unconditional support and suggestions by nearly a hundred people. It’s amazing what encouragement from around the world in the form of “likes” on a screen, about a stack of paper, can do. Thank you, BSP. This website would not exist without Susie Minton’s tireless efforts and ability to put up with cryptic barrages, Tom Hall’s web magic, and Terry Peterson’s amazing ability to bring my vision of the art to life. Thank you. I would especially like to thank people in my past who were there when it counted the most—some of whom I do not know other than for the moment we shared a brief place and time. Once, I was walking from Terminal 2 at Los Angeles International Airport to a bookstore in Marina Del Rey (with a ten hour layover to make something of). I stopped on a bridge, enjoying my music at right around the time the seabreeze was filling in. I put my arms on the railing and leaned forward gently, and I breathed for maybe ten minutes. A man came up to me, put his hand on my shoulder, and said, “You’re not planning to jump, are you?” That time, I was able to give a meek smile and say, “no.” But there was no way for him to know that I was actually in a great place, not a dark one. To strangers and friends who have helped me know that I belong in the world, my boundaryless gratitude.